Eat your fruit and take those orange peels, put them under sunlight for 2 to 3 days. Let them complete dry then grind them in a blender to make fine powder. Store the prepared peel powder in a tight jar. Use this powder in face packs whenever you want to. Listed below some simple face packs made from orange peel. Always store this in cool and dry places and keep them away from dust. Mix a tablespoon of yogurt to the orange peel powder, make a fine paste with no lumps. Clean your face with fresh water and apply the paste all over face and neck. Let it sit for 30 minutes then rinse off with the cold water. Mix orange peels powder with fresh milk to make a smooth paste. Spread this mixture all over face and neck and let it dry for 20 minutes. Gently clean it with lukewarm water. Add a tablespoon of honey and one tablespoon of lemon juice to the orange peel powder and mix it well. Apply the mixture on your face and leave it for about 20 to 30 minutes then rinse the face with some lukewarm water. You can use excess paste on hands and legs too. Make a paste with peel powder, egg white along with a few drops of lemon juice. Apply this mixture on face and let it sit for 20 minutes and rinse off with normal water. Apply this pack once in a week for better results. Combine orange peel powder with turmeric and honey to form a fine paste. Use this paste on your face and neck, leave it for 30 minutes. Now rinse your face with some lukewarm water. Take some fresh orange peels and blend them with some curd, one tablespoon honey and a pinch of turmeric powder to form a think and fine paste. Apply this paste on your face, neck and hands. Keep paste for at least 15 min then wash it off with fresh water. Blend orange peel with two tablespoons of sandalwood powder and a few drops of rose water. Apply the mixture to the face and the neck. Leave it on the face as well as the neck for 30 minutes’ time and wash the face with cold water. Add Besan flour and Yoghurt to freshly grated orange peel and make a paste with no lumps. Apply it on your face and neck. Wait until it dries completely then wash it with Luke warm water and pat dry. Unblocks excess oils within skin pores and gives clear skin. Orange peels has naturally bleach properties, it clears black spots and blemishes on your face. Brighten the skin instantly and helps reduce tan and dark circles under eyes. You will feel your skin fresh after every use. 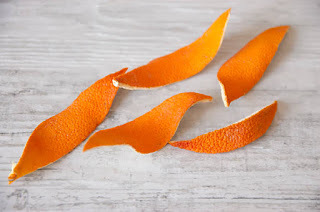 Regular use of orange peel powder makes wonders on your skin.